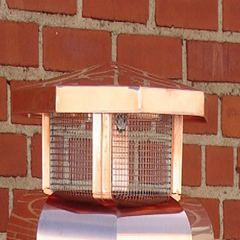 One of our top selling products is our French Curve Copper Chimney Cap. 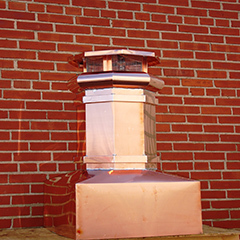 We also offer the Hip Roof Copper Chimney Cap, which we have customized, per our customer needs, as seen on our Chimney Cap product page. 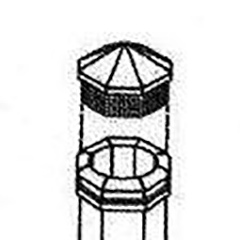 For those in the market for chimney pots, we offer the octagonal and square based chimney pots with the optional rain cap. Our copper chimney pots are made with 16 oz copper with an optional rain cap for added weather protection. 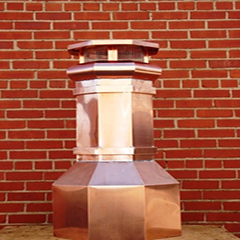 Copper chimney pots provide protection from moisture, debris, and wildlife and provide ventilation for your fireplace. Each of our chimney pots are handcrafted to fit your specifications. Copper chimney pots provide an elegant finishing touch to any home. Chimney pans available for extra protection against the weather, prices vary upon size. 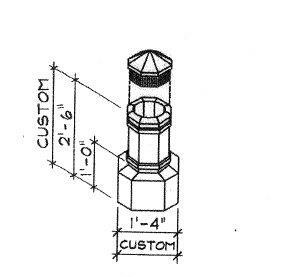 First, measure the flue (this is the pipe where the smoke comes out – usually square, rectangular, or round). Measure the span of the flues (if more than one) from the outer most edge of the length and width. 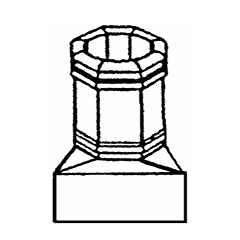 Second, measure the outer most point of the chimney crown (side to side).